Proving to be a much better camping partner than your boy who always brings a can of Dinty Moore, the Vulgar Chef has just one-upped America's favorite campfire treat by adding bacon and PB&J. 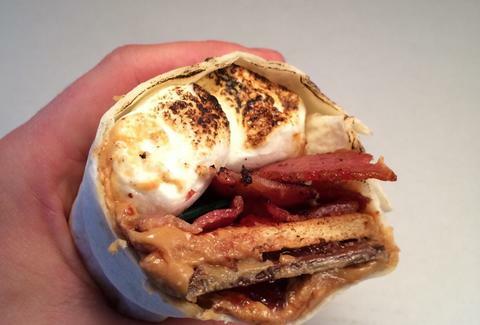 This s'morrito takes the basic marshmallow/chocolate/graham cracker s'more, then stuffs it in a tortilla and rolls it up with bacon, peanut butter, and jelly. This is how you really attract ants at a campsite... and respect. Kristin Hunt is a food/drink staff writer for Thrillist and is incredibly excited by the possibilities of portable s'mores. Follow her at @kristin_hunt.